London illustrator Ruby Taylor lends her lighthearted style to these slim writing instruments, embellished with hand-drawn patterns of stripes and diamonds and the handwritten encouragements "write it down" and "next great idea." Featuring metal components and chrome details, the pen and mechanical pencil in this set have a solid feel in the hand, and measure about 5¼ inches long. 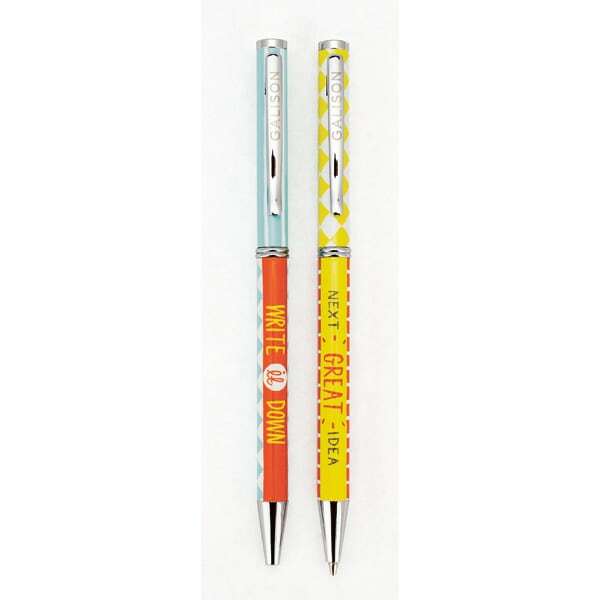 The black ballpoint pen extends or retracts with a twist, and accepts standard refills. The pencil also extends with a twist, and contains a #2 (HB) 0.7 mm lead, with a soft vinyl eraser under the cap.